The milking machine is a nearly automatic machine installation for milking cows. It is not a single unit, but rather an assembly of components designed to handle as many as 200 cows an hour. The system consists of the cluster (the assembly that is manually attached to the cow), a milk tube, a pulse tube and pulsator, a vacuum pump or blower, and perhaps a recorder jar or milk meter that measures yield. Together, the system allows milk to flow into a pipeline in preparation for shipping to a processing plant. The cluster consists of teatcups, a shell and liner device that actually performs the milking action, and a claw or manifold that spaces the teatcups and connects them to the milk and pulse tubes. The milk tube carries the milk and air mixture away from the cow's udder to receiving tanks. The pulse tube, or airline, carries the varying air pressure from the pulsator device to the tanks, drawing the milk and fluids out of the cows as well. In operation, milk is drawn from the cow's teats because a vacuum is created within the cup device, forcing the milk through the teat canal. The pulsator alternates the pressure, first creating a vacuum (milk phase), and then applying air, which causes the flexible liner in the cup to collapse and massage the teat (rest phase). The alternating process of milk-and-rest is continued in a rhythmic pattern for the cows' health and good milk productivity. Early attempts at milking cows involved a variety of methods. Around 380 B.C. , Egyptians, along with traditional milking-by-hand, inserted wheat straws into cows' teats. Suction was first used as a basis for the mechanized harvesting of milk in 1851, although the attempts were not altogether successful, drawing too much blood and body fluid congestion within the teat. To encourage further innovations, the Royal Agricultural Society of England offered money for a safe, working milking machine. Around the 1890s Alexander Shiels of Glasgow, Scotland, developed a pulsator that alternated suction levels to successfully massage the blood and fluids out of the teat for proper blood circulation. That device, along with the development of a double-chambered teatcup in 1892, led to milking machines replacing hand milking. After the 1920s machine milking became firmly established in the dairy industry. Today, the majority of all milking is processed by machine. The milking machine components are created and assembled in several major manufacturing plants throughout the world using traditional processes and procedures. Stainless steel and plastic are used for containers and liners and cast iron and steel for vacuum pumps, controls, and metering devices. 1 Here stainless steel is received in large sheet or tube form. Stainless steel is used to fabricate components that will come in contact with milk. The sheets are protected from scratches by a vinyl lining, which will be removed later after forming and machining. Milking machine components are created using stainless steel and plastic for containers and liners, and cast iron and steel for vacuum pumps, controls, and metering devices. At this point, the stainless steel from the foundry has a dull finish. 2 The steel sheets may be sent directly to a polishing station where large machines create a smooth finish. Once the initial finish is achieved, the sheets may move on rollers to numerically controlled punch machines, where they are cut into shapes for various parts. From there, some parts are formed or bent into shape on large brakes. Mounting panels for controls, structural components, and small detail parts for the claws and pumps are made at this stage. 3 The shell that contains the liner is fabricated as an extrusion. This process involves forcing steel tubing over a die under heat and pressure to form the elongated rigid piece. The claw is made as a series of smaller extruded pieces of tubing that form the manifold, which spaces the teatcups in a cluster formation. The extrusions are then manually welded together in fixtures according to the desired size. Both the completed claws and shell have a dull finish that will require polishing. 4 Receiver tanks are stainless steel tanks that receive milk from the milk lines, generally holding from 15-26 gallons (60-100 1). Although some are customized plastic, most are steel with the heads or ends spun on specialty machines. This production technique shapes a thin steel disc as it is being turned in a lathe. The disc is shaped as it is forced over a steel shape or mandrel. Once the operator forms the ends of the receiver as cups, another technician will weld the body to the head, leaving orifices or openings for milk input and output. Individually manufactured, the receivers will also be polished by hand. Some receivers will have translucent plastic panel inserts so that dairy farmers can visually gauge the cow's milk production. 5 All major stainless steel components are polished to the familiar finish associated with food-handling equipment. The manufacturers use a variety of mechanized belts, cloths, and spinning wheels in what becomes a very labor intensive process to meet government and industry sanitary standards. This polishing is in addition to the polishing the large stainless sheets undergo following receiving. Workers wield an assortment of hand polishers and attachments to shine all contact and protective surfaces, from the claws to receivers to pipelines. 6 These "drivers" of air and fluids through the system are manufactured by select vendors. The unit is basically a sealed iron case with a set of timing gears inside and an impeller, resembling two blades or paddles on a shaft, that spins at over 3,000 revolutions per minute to create a vacuum that will draw fluids in the line. The making of the pumps requires raw castings to be poured for the various parts. The rough parts are hand-machined on a bench by technicians and then placed on a CNC rotating cutter table where the cutting stone makes two precise passes along the pre-determined edges to cut away any rough surfaces. The assembly of the major components—along with seals, bearings, and shafts—is critical because a variation of just 0.002 inch can change the balance and affect the pump. The components are placed on a coordinate measuring machine where the profile is checked so that all parts fit properly. The technicians, using feeler gauges, will set proper clearances before locking the critical gear parts in place and bolting the unit together. Then they will run the pumps in a test booth before releasing them for distribution. 7 The manufactured and purchased parts are placed in several different areas where the milking machine subassemblies come together. Technicians will select the parts according to the system design specifications, often customized to meet certain operations. It is at this stage that pressures and loads will gauge equipment performance. Final assembly of all machine components will not occur until after shipment to the farm and installation in bams, where often elaborate stalls and stations will be used to maximize the milk harvest. Workers at assembly will also make initial line connections from valves to pumps to meters, checking for tolerances and poor fits. Vacuum pumps or blowers, the heart of the milking system, are tested so that both milk and accompanying air can be efficiently removed. The pumps will be tested under simulated loads. Vacuum controllers, which admit the necessary air to maintain the proper vacuum level, are selected. The air lines and milk lines are selected to size and connection hardware grouped. Controls, also purchased, are prepared for installation. Milking machine manufacturers are subject to a variety of standards, some self-imposed. In addition to inspections throughout the manufacturing process, all installations are set up by trained dealers and electrical contractors. Equipment designers follow Association of Agricultural Engineer standards and sanitary guidelines established by a dairy industry council. Advances in technology have introduced several new innovations to milking machines. Automatic detacher units that connect loosely to the milking claw allow cows to move and shift freely during milking. 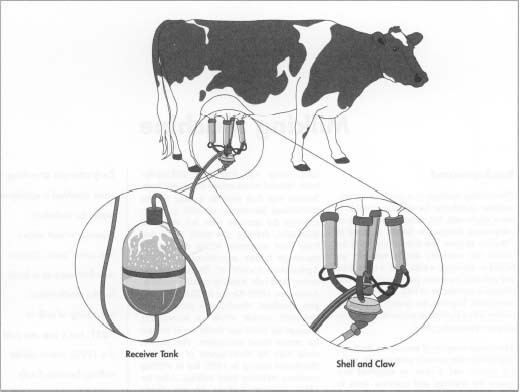 Based on the rate of milk flow, the detacher can also detect the end of milking, shutting the vacuum and actually removing the claw from the cow. Automatic backflushing units are also gaining popularity. These units and systems send chemical and rinse solutions through pipelines and clusters to reduce the risk of infection and mastitis (udder inflammation). The use of automatic identification systems, such as electronic transponder cow neck-tags, have enabled dairy farmers to keep track of milk production by individual cows. Robotics are at the forefront of milking technology, especially in Europe. Automatic attachment devices have been created but not quite perfected. This new innovation will require little manual labor, and the machines will oversee much of the milking process from the time a cow enters a milking center until it leaves to graze. Machine Milking and Lactation. Insight Books, 1991. Maximizing the Milk Harvest. Milking Machine Manufacturers Council, 1993. Blankesteijn, Herbert and Daniel Clery. "Milking Automation for All It's Worth." New Scientist, February 1, 1992, p. 27. Spahr, Sid. "Coming: New Dairy Ideas from Europe and Israel." Successful Farming, October 1987. Wittenberg, Gunter. "A Robot to Milk Cows." The Industrial Robot, 1993, pp. 22-25.